County Chronicle by Angela Thirkell – not only am I thrilled to have my hands on another Angela Thirkell but I am delighted to have finally borrowed a book through the interlibrary loan system! 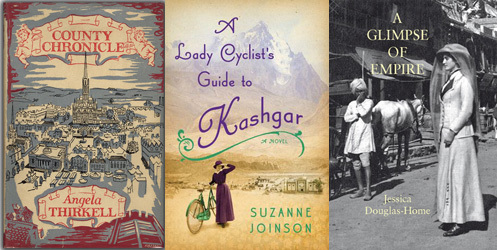 A Lady Cyclist’s Guide to Kashgar by Suzanne Joinson – so many of my favourite bloggers received review copies of this from Bloomsbury this spring that I couldn’t help but be intrigued after hearing it mentioned everywhere. In present-day London another story is beginning. Frieda, a young woman adrift in her own life, opens her front door one night to find a man sleeping on the landing. In the morning he is gone, leaving on the wall an exquisite drawing of a long-tailed bird and a line of Arabic script. Tayeb, who has fled to England from Yemen, has arrived on Frieda’s doorstep just as she learns that she is the next-of-kin to a dead woman she has never heard of: a woman whose abandoned flat contains many surprises – among them an ill-tempered owl. A stunning debut peopled by unforgettable characters, A Lady Cyclist’s Guide to Kashgar is an extraordinary story of inheritance and the search for belonging in a fractured and globalised world. A Glimpse of Empire by Jessica Douglas-Home – the story of a young Anglo-Irish beauty’s visit to Delhi for the 1911 Royal Durbar, where a new King, George V, is to be proclaimed Emperor to reinforce the loyalty to the Crown of India’s ruling Princes. For a fortnight of relentless ceremony, unheard-of extravagance and imposing military spectacle, in the setting of a vast Tented City complete with its own farms, railway, telegraph and post offices, Lilah Wingfield meets many of the most remarkable colonial characters of the day, including some of the foremost Indian Princes, vying to stage the most lavish display to prove their devotion to the Raj. 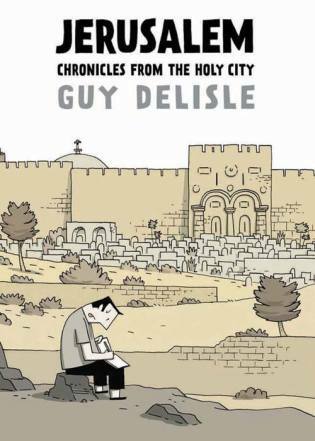 Jerusalem: Chronicle from the Holy City by Guy Delisle – though I’m not usually a fan of graphic novels or cartoons, I adored Delisle’s earlier graphic memoirs of his time spent in Pyongyang and Burma. Delisle finds himself living in Jerusalem for a year when his partner, who works for MSF (Doctors Without Borders), is transferred there. With her at work and their children in school, he has ample opportunity to explore and ponder the cultural conflicts that define the region. I read this in one sitting, beginning immediately after picking it up from the library, and was again very impressed by Delisle’s writing. As usual I am envious. Particularly of the empire book! I recently read A Lady Cyclist Guide to Kashgar, and will post about it soon. I felt it was interesting, though a little long in places. I have the Lady Cyclist book but I haven’t read it yet! Maybe soon. A Glimpse of Empire sounds amazing, with the combination of diary entries and her own photographs. One of the local university libraries has it, so it’s my turn to try interlibrary loan. Got the cycling guide on my hold list at the library (they’ve got it on order). Meanwhile, the Glimpse of the Empire looks soooooooo enticing. Exactly my cup of tea. And with pictures, too! Jerusalem looks interesting. Enjoy your loot! Still reading The Kashmiri Shawl, almost finished it, but picked up Kate Fox’s Watching the English (she was speaking with Grayson Perry on his recent series of three programmes In the Best Possible Taste on TV here in the UK.) Also, taken delivery of the lovely ‘style’ book by Ros Byam Shaw, Perfect English Farmhouse, and waiting for a book I read in my youth (before it was pronounced as yoof! ), The Best of Everything by Rona Jaffe. Loved the book and saw the film when I was young an impressionable! PS – Now finished The Kashmiri Shawl – a lovely novel but I feel that the author enjoyed writing the 1940s section rather than the present day section. Indeed, the ending (present day) seemed rather a damp squib but overall, a lovely read. I’m pleased to say The Best of Everything has arrived. Will be starting that later today. 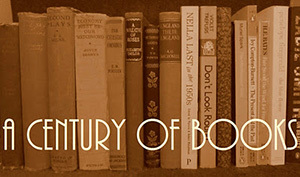 Probably not my type of my books, but they look very interesting all the same. The one I’d probably pick up would be The Lady Cyclist’s Guide to Kashgar, so I hope you enjoy and I look forward to your thoughts!